Those of you who've read my posts here know that I’m an avid iPhone fan—and those of you who followed my long and storied career over at Macworld’s Gadgetbox know that there’s nothing I like more than good robot (unless it’s a good toaster, or, heaven forbid, a robot toaster). And so who better to bring you new of this combination robot and iPhone, constructed by one creative Japanese iPhone owner. 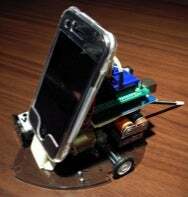 He rigged the iPhone on a wheeled platform, controllable from his MacBook Pro via Wi-Fi. But, that’s far from all. More to the point, he recorded the feed from the iPhone’s camera (as video) so that he could recreate the experience of being an iPhone robot. The result is a trippy video with a thumping techno beat and creepy Macintalk voice whispering “iPhone” over-and-over again. Or, in other wods, surefire genius. The same guy also put together a physical keyboard that plugs into the iPhone (sorry, folks, it only works under jailbreak). Quite the busy inventor: I wonder what’s next on his plate.